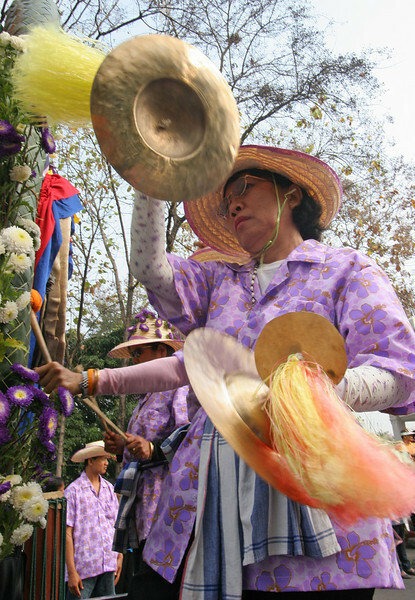 Chiang Mai's Annual Flower Festival features a elaborate parade with dozens of floats made using real flowers. After crossing Narawat Bridge and passing the VIP stand, the parade heads into town via Thapae Gate and around the moat to the southwest corner where the floats are parked for the public to see. Many vendors have plants and flowers for sale for the whole weekend. Chiang Mai's Annual Flower Festival features a elaborate parade with dozens of floats made using real flowers. After crossing Narawat Bridge snf passing the VIP stand, the parade heads into town via Thapae Gate and around the moat to the southwest corner where the floats are parked for the public to see. Many vendors have plants and flowere for sale for the whole weekend.